A Collaborative Art Exhibit organized by the Cultural Heritage Artists Project, the Jewish Art Salon, JWalks and the Holocaust Memorial Center. February 22 - April 14 in Metro Detroit. Todd Weinstein has been photographing in Germany since 1994. His project Darkness into Light: The Re-emergence of Jewish Life in Germany arose from his great curiosity about why Jews would return to Germany some 60 years after the fall of the Third Reich and why some never even left. During his visits to Germany, Todd started to photograph newly renovated synagogues that had not been totally destroyed during World War II. He wanted to show how Jews were determined to live and practice their religion and culture in the land that had perpetrated unspeakable crimes and horrors upon them. His work in Germany has profoundly affected him and he is working on other projects with Jewish themes even now. 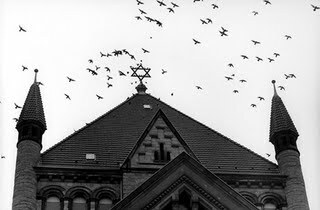 Weinstein’s project for The Silent Witnesses shows two images of newly renovated German synagogues – the West End Synagogue, Frankfurt-am-Main, Germany and Birds over Synagogue, Köln, Germany – and one most recently found abstract image, Moses with Broken Tables, New York City, that he photographed in New York City and is taken from his series The 36 Unknown, which concerns the 36 righteous people who, according to Jewish mystical tradition, help to keep the world from destroying itself during times of peril. 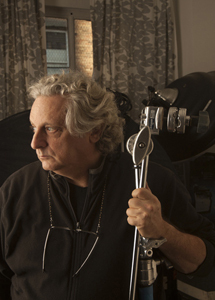 Originally from Detroit, Todd Weinstein is a photographer who has been based in New York City since 1970. He has exhibited and traveled worldwide for his personal work and special projects for companies and museums. Most recently, he has been producing and developing new content for new media platforms. He also teaches workshops in the USA and overseas, keeping the spirit of his teacher and mentor Ernst Haas alive: “To Dream With Open Eyes”.